Soon after making Aliyah, I discovered my lack of knowledge relating to the Holy Temple. I recognized I had no information relating to its true spiritual depth and cosmic greatness. Thank G-d, my Aliyah decision to return home, to Israel, became the catalyst that enabled me to engage in the ongoing study of the Temple.As I pursued knowledge on Temple teachings, my heart and soul awakened to Temple consciousness. This made me profoundly aware of the necessity for all Jews, wherever they are, to study this awe inspiring topic which is vital to our national mission. As a result of living in the Jewish Quarter of the Old City in Jerusalem,in close proximity to the Temple Mount, Judaism’s holiest site where the Temples stood, I also felt the impetus to learn more about our beloved Beit HaMikdash (holy Temple). I cherished the close proximity of our new residence, to the Temple Mount, because of its spiritual significance. Sometimes, I would awaken in the wee hours of the morning and be magnetically drawn to arise from my slumber and explore my new world. I would quietly grab my clothes, make my bedroom escape, dress and depart the house in order to explore the Jewish quarter. I delighted in the private discovery time and felt like a child sneaking away from home, on a private, magical adventure. I named my early morning outings, my spirit walks, because I felt my Jewish spirit come alive.as my imagination awakened and intermingled with the ancient biblical sites. I felt as if, I was alone with all the memories of those precious Jews who had come before me to live and die for our nation. My special outings were soul stirring and I felt enlivened by them and intensely connected to both G-d and the Jewish nation. In my Jewish quarter wanderings, I discovered the Broad Wall, a 23 feet thick foundation of an Old Testament city wall built in 701 BC by Hezekiah, King of Judah, to protect the city from the Assyrians. Farther down the road, I passed the Burnt House, which is a charred ruins of an industrial workshop located in the lower level, of a home where the priestly family called Bar Karos resided. This information was gleaned from inscribed stone plates unearthed at the site. This site bears the most complete evidence of the city’s fiery destruction by the Romans because the archaeologists discovered the remains of a skeletal hand and arm of a woman clutching a scorched staircase in an attempt to escape. The Burnt house left me with a very unsettled feeling as I became a witness to the proof of the painful destruction of the Old City. It was very real in a haunting way. It pained me to be reminded of the horrible destruction of our holy nation in our beloved land.The museums and historic sites in the Old City also aroused my quest for awakened Temple consciousness because they were connected to the historic time periods, I was reading and studying about. Many Jews are unaware, as I was, that we are commanded by the Torah, to revere the Temple. We revere it, because of the One who commanded us to build it and whose presence permeated it and will once again permeate it, when the third Temple is rebuilt. The Temples were G-ds gift to the Jewish nation and the world. The Temple was shrouded in spirituality because it created a physical dwelling place for G-d. The Torah teaches us that the influence of the Temple service was palpable and the radiance of G-ds presence could be deeply felt by all present and even extended out to the Jerusalem environs. It was a cosmic manifestation of G-d and a precious gift to the entire world and it contributed a great benefit to society. Jewish teachings explain that we have an obligation in all times, to learn the laws of the Holy Temple, its history, its structure, the services and sacrifices practiced there. Through undertaking this endeavor, it will be, as if we are building the Temple. Our studies should be carried out in anxious anticipation of the Holy Temple being rebuilt and should be ongoing. It is the job of every Jew to study about the Holy Temple with the understanding that in the very near future, we will see it manifest before our eyes. I received my first in-depth teachings related to Beit Hamikdash ( the Holy Temple) through the information presented by the Third Temple Institute, which is located in The Old City in Jerusalem. They can be found at http://www.templeinstitute.org. This is an amazing organization which has vast information on all aspects of the Temple. Another great web site related to Temple teachings: http://www.ahavat-israel.com/torat/temple. To conclude, I am sharing a portion of the Shabbat Torah teaching by Rabbi Nachman Kahana from the Old City of Jerusalem. His vibrant teachings will also awaken your Temple consciousness. 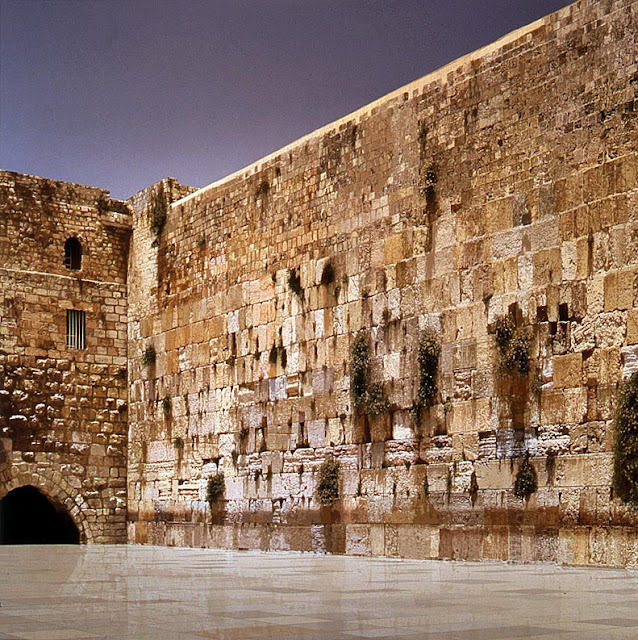 A: During the three weeks between the 17th of Tammuz and the 9th of Menachem Av, one thousand nine hundred and forty six years ago, a hand-to-hand battle raged between the soldiers of Rome and the Jewish defenders over every meter of hallowed ground in the walled city of Yerushalayim. It took the Roman Tenth Legion, superior in number and weapons, led by the infamous Titus, three weeks to defeat the Jews who entered the battle already sick and famished. It took the Romans another 32 days to advance from the Temple Mount to today’s Jewish Quarter, the distance of about 150 meters, which illustrates the ferocity our forefathers fought with in defending the Holy City. On the 11th of Elul, the city finally fell to the battered Roman Legion. The smell of death and the cries of the dying filled the air. Carnage filled the narrow alleyways. The Romans showed no pity, neither to those who were still alive nor to the dead who they defiled. The elderly couple is our grandparents – every one of us. To whom was savta (grandma) referring when she said to saba (grandpa) that their descendants would return and rebuild? She was referring to you and to me and to all our brothers and sisters who merit being in Eretz Yisrael at this time. We are the chosen of HaShem to rebuild, to restore the physical destruction and to re-ignite the torch of hope in our hearts for the final redemption which will be realized here in HaShem’s Holy Land. Our generation is one of the greatest for a Jew. Of all the millions of Jews who have passed this world in the last 2000 years, it is we whom HaShem has chosen to be His agents in restoring his presence in the Holy Land. The challenges are great; the rewards are even more amazing. The rewards in this world are the fruit of our labors from the small trickle of olim (new immigrants) 120 years ago to their children who are erecting the skyscrapers of Tel Aviv and the pilots who police the skies above the Holy Land and learn HaShem’s holy Torah in purity. What a joy to see our younger generation, who after years of yeshiva study, are taking their places of leadership at the helm of Israeli society, in education, the military, medicine, academia, industry, engineering etc., preparing the Land for the next phase of Jewish greatness. My dear friends, the Beit HaMikdash is not a spiritual fantasy. It is a vital, soon to be built reality that will effect the entire world. It is a promise from G-d Himself. But it is our job as Jews, to both make Aliyah and to awaken our Temple Consciousness. We need to do both in order to make the Temple a reality. Come home and be one of the builders. It is the Best job in the world. Be aware, Aliyah is a potent vehicle for change and awakening your consciousness because it helps us come to terms with our lack, whatever it may be i.e., knowledge, personal power, self-control, etc. This is a huge gift! One could say Aliyah memories are a dime a dozen, thereby minimizing their potency but I love recalling the diverse memories relating to aliyah experiences. They were the occurrences that began to shape my new life in Israel. Each new experience added a unique dimension to my personal growth, as they taught me about myself, as well as Israel. I feel blessed that my Aliyah memories are predominantly positive….especially the humorous stories, for they allowed me to lighten up and stop taking life so seriously. I would like to share the following quote, which I made up: “if humor isn’t part of your innate make-up and it trips up your brain, maybe Aliyah shouldn’t be a consideration.” Now, you have probably figured out that I am a total Aliyah pusher, but honestly, Aliyah does test you on every level and if you cannot laugh at yourself, well, you could be in big trouble, if you make that decidedly significant move. Aliyah memories and humorous stories are the dynamic duo that sit side by side in every undertaking, as you settle into your new country and home. They have the potential to cause epic explosions of laughter, as the multi-faceted realities of Israeli living experiences and challenges chip away at your ego and sense of self. However with humor as your companion, you could actually be guided into a state of freeing laughter. Having said all that, I will now divulge some of my own personal Aliyah memories of humorous stories. Hebrew Word Stories: I love words and I like speaking clearly, so I am heard and understood. Early on, while living in Jerusalem, I was working at learning some simple words and phrases. Since we were eating out quite a bit, I wanted to learn the words that state something is tasty. I learned that if you enjoy the taste of something in a restaurant, they love hearing you say that it was “ta-im me-0d”. This means it was very tasty. I like the sound of that. I was also learning the word “na-im me-od,” which is what you say, when you meet people for the first time. It means nice to meet you. Camel Stories: The words, “Middle East” personally conjures up childhood memories of the book “Tales of Arabian Nights”. Perhaps, with my imaginative energy being consumed by books of all flavor and variety, I perceived the darkly fascinating Middle East as a mythical place. Yet, here I was suddenly living in that place and I decided to watch my back , so to speak. One autumn day, an Arab man wearing the traditional long white robe with his head covered by the red and white scarf (keffiyeh) started following me, while I was walking to the grave-site of King David. I felt a little nervous especially as I recalled the book, “Tales of Arabian Nights”.In a deep, husky voice sounding rather ominous, he said, “would you like to ride my camel?” I was shocked and extremely indignant! I asked him exactly what he meant by that question! To my extreme surprise, he started laughing. Suddenly, I spied his camel around the corner. Need I say more? Speaking of camels…..I once had a taxi driver ask me how many camels my husband paid for me. I laughed the entire taxi ride and even getting out of the taxi. Another time, I had an Arab taxi driver ask me, if I wanted to become his 4th wife…..now that was creepy cause he was dead serious but at least we didn’t discuss camels. Thank G-d, we soon purchased our car and that took care of my Aliyah memories relating to humorous camel stories. However, there is one more to add. When my youngest daughter was visiting, we were in southern Israel and saw a sign that said, “Camel Crossing Ahead”. We laughed and thought it was a humorous Middle East joke.A few miles ahead, we saw a large herd of camels crossing and we laughed out loud,realizing we were after all living in the Middle East. Taxi Drivers Stories: Taxi driver’s are a great source of information relating to the history of the land, as well as fascinating stories. As far as I am concerned, they should have a taxi drivers story night. I think they could make a lot of money. I certainly would attend! One taxi driver I rode with was born in the old city of Jerusalem and he recalled eating grass and weeds to stay alive during the 6 day war. Another one, was the first baby born at the Hadassah Mt. Scopus hospital where his mother was taken by armored car to give birth. She refused to stay in the hospital more than one day because the hospital was under fire. She also returned home with him in an armored car. Another taxi driver grew up in the location of the new, prestigious Waldorf Astoria hotel in Jerusalem. As a child, he would hide and watch snipers shoot at his mother, as she hung the laundry. I actually miss those poignant and informative stories from men who have experienced a great deal of life and history in the Holy land. Restaurant Stories: My husband was very excited at the sign in the restaurant window that said oriental food. He grew up in new York and loves Chinese food. He asked the waiter in his broken Hebrew if they had egg rolls and the Israeli waiter cracked up laughing. It was a Moroccan restaurant. The truth is anything oriental means it is predominantly related to the Eastern world and to the continent of Asia.My husband associated oriental with Chinese….I did as well. I cannot believe that 13 years have passed since my husband and I set foot in our first home in Jerusalem. I can vividly recall many facets of the unfolding of that auspicious day, in spite of being completely physically and emotionally drained. The one Aliyah memory that stands out and truly personified new beginnings was our arrival in the Old City of Jerusalem, the eternal and holy capital of Israel…our new place of residence. A part of me felt like a child, so in awe of her surroundings, about to enter the Palace of The King. It reminded me of how the Jews must have felt crossing the reed sea, leaving slavery behind and going forward into new beginnings. My spiritual knees were trembling as I walked towards our new home. When we arrived in the old city, we were kindly greeted by the son of a friend. He helped us with our bags and guided us to our apartment because we had actually forgotten the exact location. When he opened the door for us, he said in the most casual way, “Welcome to your new home! This apartment has been waiting for you your whole life!” I was stunned by his prophetic words and I remember shockingly saying to myself, yes, it is true! I breathed in the resonance of the truth of his statement and the full force of the privilege and giftedness of being in G-ds chosen land, the spiritual epicenter of the universe, unleashed my long restrained emotions, and the tears began to flow.Can you imagine standing in a place where you know your soul is going to come alive in a way you cannot even comprehend, but you know its true? It is frightening, exhilarating, wondrous and at the same time discombobulating. Now that’s a word I haven’t used in a long time. After our friends departure, I remember feeling a bit dazed, so I slowly walked around opening up all the windows and the door to the balcony. I slowly became aware of the light streaming into the apartment. It seemed to grab hold of me in some mystical way and I remember saying to myself, I am Coming Into The Light! Those words felt compelling and held some deep meaning to me which I did not understand at the time but would ultimately comprehend as time went on. I felt a rather strange glimmer of intuition as if a spiritual convergence of some kind was happening. It was an amazing experience and one I had never felt before. I felt a strange fascination with the unfolding of our future as time went on. My husband and I knew we were in for a spiritual overhaul but we had no idea how it would play out. It was mystifying yet exciting. As time went on, we would learn in a very meaningful way that all the challenges we would face, would be a direct result of coming into the light of Aliyah. These Aliyah memories of new beginnings continue to impart renewed inspiration to my soul and serve to remind me, I will always be crossing the seas of life to new beginnings. My dear friends, if you knew what you stand to gain by returning home to this most extraordinary Jewish country, even with all its challenges, you would run to the nearest Aliyah office and say, Sign Me Up, I guarantee it. The Aliyah memories you create with your own personal new beginnings will hold a lifetime of inspiration. To celebrate my 13 year anniversary, I want to share with you some of my favorite places and things to do. Favorite Places: Ein Gedi Kibbutz in the Dead Sea Area: Gorgeous Kibbutz with great accommodations. The only botanic gardens in the world where people live. Includes Free pass to Dead Sea Spa. Hamat Gader: Ancient spa ruins with modern mineral pools. Beach at Naharia: the water is very tame and it has lots of places with shade coverings. Nature parks in the north, Beit Shean: Great ancient Roman ruins, Adir winery in the Galilee for brunch….all homemade bread, jams and goat cheeses which taste amazing, Golan winery wine-tasting, Hevron: Tomb of the Matriarchs and Patriarchs. Naval Museum in Haifa. Shilo, where the ancient Mishkan stood. The grave of Rachel and the list goes on. Favorite Things to Do: Israel Philharmonic Orchestra, Tel Aviv Arts Fair held on Tuesdays and Fridays only, but a Must see. IDF museum in Tel Aviv..Exceptional. Beach excursions. Gathering for Kohanic Blessings during Sukkot at the Kotel. Sukka hopping. Purim outings to give away goodies to IDF base and outposts. Exploring new towns and cities. Temple Institute in Jerusalem. One of my personal favorites…. Lit Chanukah Menorahs throughout the Jewish neighborhoods….Beautiful, Moving and Inspirational. Israel has it all. My mother passed away 12 years ago, this week, and I miss her so deeply. There was only one way I could ease the pain in my heart and that was to share her with all of you, so that she could come alive through my words and memories. We did not have a perfect relationship but we had a perfect love, for we valued and cared for each other in the way we could. We admired and respected one another and we savored each other’s company. Her legacy lives on through me and my children. “Each woman is far from average in the daily heroics of her life, even though she may never receive a moment’s recognition in history” (author unknown). My mother Helene was far above average in the heroics of her life. She manifested these heroics through overcoming the challenges and losses presented to her at a young age. With grace, she played the hand that was dealt her, as she faced the loss of her father at age 14, the loss of her adorable little 3 year old sister and also her beloved 21-year-old sister, while she was still living at home. And yet the greatest loss of all was that of her 3rd child, her precious firstborn son, at the tender age of one week. And then later in life when she was 77, her second son, at the age of 44, succumbed to Leukemia, one year after her husband of over 50 years passed away. She was intimately familiar with great loss and yet, as a result of her humble acceptance of these profound losses, and her resultant strivings to make every day count, she revealed the greatness of her soul and truly excelled as a heroine in her life story. Typically, when we extol the virtues of our mothers, we recite a litany of their hard work. However, that would not be the primary description of the virtues of my mother, Helene, in spite of the fact that she worked constantly from morning to night for the good of her family. The primary virtue of my mother Helene was her faith in G-d and her core belief in the goodness and beauty of life. She personified the strength of a righteous woman who knew G-d personally. My mother did not unload her problems on her children or anyone for that matter. I think she personally delivered them straight to G-d Himself and they discussed them. Afterwards, I think she simply accepted them and went about her days smiling, as if some Divine secret had been revealed to her giving her profound peace of mind. I owe Heaven an un-payable debt for giving me a G-d fearing mother because she filled my life with the wealth of wisdom that comes from knowing G-d intimately and profoundly. My mother was the vital life force of our family of seven girls and one boy for the entire length of her life. Her calm, feminine presence was a balm for the soul of our home where she reigned as house-keeper, cleaner, laundress, nurse, cook, baker, decorator, gardener, wife and mother. Her love of singing carried music throughout the house and her laughter and joy spread sunshine in every nook and cranny. My mother was a radiant spirit who glowed with both inner and outer beauty. She greeted her days with joy, positivity and good humor. She generally awoke before the rest of the family, in order to dress and begin the task of fixing breakfast for 10 hungry souls. Mother had an exquisite flare for dressing and style and knew how to tastefully adorn herself. She also had a great flare for decorating and placement of furniture and embellishments. Her talents were many and varied and they lent themselves to living in a rich and beautiful environment which I highly prized. She taught her children to embrace life and persist in overcoming whatever challenges came our way. How she lived her life remains as a moral compass for my own life because in truth, more than half of what we become as adults, we become through imitation and my mother was a great role model to imitate. There is a Yiddish Proverb that says,”One mother achieves more than a hundred teachers.” That was certainly true of my mother. I was one of her greatest admirers and I loved her dearly. Mother never complained: she simply dug in and found the strength to do what needed to be done in a happy fashion. She never made a big deal about how hard she worked for she truly felt she was serving her mission and purpose in life and that was extremely satisfying to her. It was her gift back to life. Thus, she served life not only joyfully but willingly and with a full heart. No medal of honor could reward the bravery of my mother, her deeds of valor and her shining faith and trust in G-d. Simple acts of courage emerge into sharp focus as I reflect on her life and I am often left speechless even now at age 66. My mother spent a year in a TB sanatorium away from her two little girls, age 3 and 5. And when she returned home, she brought her inspiration and light with her. The most stirring quality my mother possessed was the ability to move through the challenges of life with exquisite grace. I believe my mother’s life resonated with an inner music that allowed her to dance through life with a rhythm all her own. My mother had a fullness of life experiences and this aspect manifested as a radiant facet of her beauty. I saw it as a child but understood it only as an adult. As a child returning home from school or a newlywed returning home for a visit, I could not wait to catch sight of my mother’s beautiful, tender loving face and her radiant smile. Being in her presence filled me with joy and pleasure. Mother was compassionate to the less fortunate and on numerous occasions fed the poor and helped to clothe the needy. This aspect touched me deeply and has become a quality I strive to emulate. My mother had a great laugh, a graceful persona and she was extremely witty and clever. She wrote poetry and loved storytelling which she did in a vibrant, expressive way. Mother loved nature and the outdoors and spoke of it in glowing adjectives. She was like a flowing natural fountain refreshing all manner of life around her. As I was reflecting on the lovely attributes of my mother Helene, I was reminded of the Persian convert to Judaism during the Second Temple period, named Queen Helene. She was known as a generous noblewoman who was reputed to have provided grain and dried figs, imported from Egypt, for the poor and hungry of Jerusalem. Additionally, she donated a golden chandelier, which hung high in the entrance to the HOLY TEMPLE. When the sun would rise from the east, it would light up the golden chandelier with an exquisite radiance. The brilliant light radiating from the chandelier in the Temple would herald the time of reciting the Shema and all the residents of Jerusalem would gather. This created a dynamic unity whose sphere of influence spread out into the world. I believe both Helene’s shared virtues in common, as well as names. I am so grateful to G-d for the gift of my beloved, amazing mother Helene and for the fine example she set for me to emulate. Noted teacher and lecturer, Charles Swindoll says, “If you were blessed with a good mother, you reap the benefits all your days.” How True! May her neshama have an aliyah in Shemayim on her Yahrzeit. May we merit to create our lives as beautifully as did Helene and merit to teach and inspire others to mold and sculpt their lives into stunning works of art directed by the teachings of the Torah. The sages in Eretz Yisrael were furious. True, Hananiah was a great scholar, among the greatest of his generation. But even after he left for Babylon, Hananiah continued to set the Jewish calendar, deciding whether to add a leap month and determining the first day of the month. Why were the sages so disturbed by Hananiah’s setting the calendar in Babylon? The Talmud (Berachot 63b) explains that their response was based on the verse, ‘For Torah will go forth out of Zion, and God’s word from Jerusalem’ (Isaiah 2:3). The source of Torah — including determining the Jewish calendar — is Jerusalem and the land of Israel. Why is it so important that Jerusalem be the center of Torah instruction? We must first understand this verse, ‘For Torah will go forth out of Zion, and God’s word from Jerusalem.’ What is the difference between Zion and Jerusalem? While Zion and Jerusalem refer to the same locale, they indicate different aspects of the holy city. The word Zion literally means ‘marked’ or ‘distinctive.’ It refers to those inner qualities that distinguish the Jewish people, ‘a nation who dwells alone’ (Num. 23:9) with their own unique spiritual traits and aspirations. The name Jerusalem, on the other hand, indicates the city’s function as a spiritual center for the entire world, influencing the nations of the world. Jerusalem is the means by which Israel’s spirit of holiness penetrates and uplifts the inner life of distant peoples. In short, Zion looks inward, emphasizing the city’s internal significance for the Jewish people, while Jerusalem looks outward, stressing the city’s universal role as a spiritual focal point for the world. It is axiomatic that the spirit of Torah and its ideals can only flourish when the Jewish people observe the Torah’s mitzvot. For this reason, the verse first stipulates that ‘Torah will go forth out of Zion.’ First the Jewish people must follow Torah and its mitzvot; only then can God’s word disseminate from Jerusalem to the rest of the world. The two parts of the verse thus correspond to the dual aspects of Zion-Jerusalem. First there must be Torah in Zion, focusing inward. Then ‘the word of God’ — the universal prophetic message — can spread to the rest of the world, emanating from Jerusalem, the international quality of the holy city. What does all of this have to do with setting the calendar? There are two aspects to setting the Jewish calendar. The first is to determine the hour of the new moon, and the second is to calculate whether it is necessary to intercalate an extra month so that the lunar cycle will remain in sync with the solar year and the seasons. In rabbinical literature, the sun is often a metaphor for the nations of the world, while the moon represents the Jewish people. Thus the two calculations of the calendar correspond to the two aspects of Zion-Jerusalem. We need to determine the time of the new moon in order to observe the special lunar calendar of Israel — this is the internal Torah of Zion. And we need to declare a leap year in order to maintain the proper balance between the lunar year of Israel and the solar year of the nations — this corresponds to the universal message emanating from Jerusalem. But why must the Jewish calendar be set in the land of Israel? The restriction on setting the calendar in Eretz Yisrael reflects a fundamental axiom of Torah. For the Torah to influence and enlighten the world, it must be established as a complete Torah, a Torah that governs all spheres of life. By setting the calendar outside of Israel, Hananiah disconnected the Torah from the myriad aspects of life as a nation living in its own land. He reduced the Torah to a personal religion that only relates to the ethical refinement of the individual and one’s private connection to God. Such an approach impoverishes the multifaceted richness of Torah. As the sages warned Hananiah, this was akin to setting up a private altar to serve God — an irreparable break from the true goal of Torah and the people of Israel. Jewish life abounds with symbols and religious objects both tangible and visual that relate to its beliefs and lofty ideals. These symbols and objects help to bring Israel’s long, fascinating history to life, as we utilize them in relationship with our daily Jewish living. They also bring depth and meaning to the Jewish holidays which are often shaped by the symbols themselves. Symbolism is defined as the use of symbols to convey special meanings or significance. It also means attributing meaning to objects, events or relationships. Judaism utilizes symbols such as: numbers, metals, minerals, spices, colors, artwork, and other objects throughout the Bible, as a means to understand and connect to the deeper meaning of the symbols. The symbols have the ability to affect both the intellect and emotions, as their appeal is extremely powerful. Utilization of symbols by a religion or religious person can create a deep, meaningful experience between G-d and man. For example, the Jewish nation is compared to the moon and just as the moon gets its light from the sun, the Jewish nation receives its spiritual light from G-d and His Torah. Just as the moon physically evolves and gets bigger and then smaller, so too the Jewish nation throughout its history has declined and grown. This visual symbol creates a powerful story of the Jewish people and a way to relate to our greatness. Discovering how these symbols can positively affect your life is exciting, meaningful and essential to getting the most benefit from your holiday experience. Interestingly, these symbols send messages to the subconscious mind eliciting various responses. The ancients of Israel and other cultures understood the power of symbols and used them extensively in their artwork and rituals. They were also used as aides for protection, fertility, wealth, success, crops, and birth and death rituals among others. We can bring this beautiful awareness into practice and derive great spiritual pleasure in its transformative utilization. Research shows that using a symbol geared towards a certain goal can help the consciousness to release and hone in on the energy pattern necessary to bring about the desired manifestation. In this way, symbols are like road maps, leading the individual towards a desired goal. The road is not a real road but an energy channel. Energy, like a roadway, twists and bends and connects two things together that would be difficult to reach under normal circumstances. These energy paths are effective because they have been used for years. Symbols acts like keys that help us unlock and tap into particular energy pathways. The more often our consciousness dips into this energy stream, the more easily our consciousness can tap into it. With this in mind, we should be able to utilize our Jewish symbols in a much more dynamic way, especially as the Rosh HaShana holiday approaches. As symbols go, the shofar is one of the most important symbols used during the entire month of Elul and into the month of Tishrei. The shofar is a musical instrument made from the horn of a Kosher animal i.e. goat or ram (but not a cow, which reminds us of the sin of the golden calf). The shofar comes in a variety of sizes and is incorporated into the Rosh HaShana and Yom Kippur liturgy in the synagogue. The shofar is frequently mentioned in the Talmud, Rabbinic literature and the Hebrew Bible. Its primordial, penetrating, wordless sound serves to arouse the Jews to awaken to repentance, as it stirs the soul to both remorse and longing to connect to the awe of G-d. The sound of the Shofar was heard when the Jews accepted the Torah on Mt. Sinai. It will once again be heard when its clarion call will reunite the Jews from all corners of the world at the time of our Redemption. It also reminds us to pray for the rebuilding of the Temple when shofars and trumpets will resound throughout the world. It is a powerful instrument of inspiration! 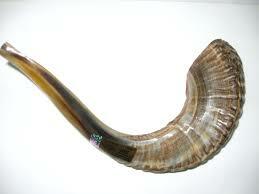 Thus, the shofar elicits many emotions and responses as we tap into its deep symbolic meanings. Since Rosh HaShana is fast approaching, it is vital to become familiar with the symbols used during the holiday services and the meals as well. Understanding the deeper meaning of the symbols allows one to enter into the secret chambers of their true power thereby bringing tremendous blessings to you. Rosh HaShana, the first holiday of the Jewish New Year is laden with rich and tasty symbolism also referred to as significant omens. It is customary to eat luscious apples dipped in rich, savory honey at the holiday meal. 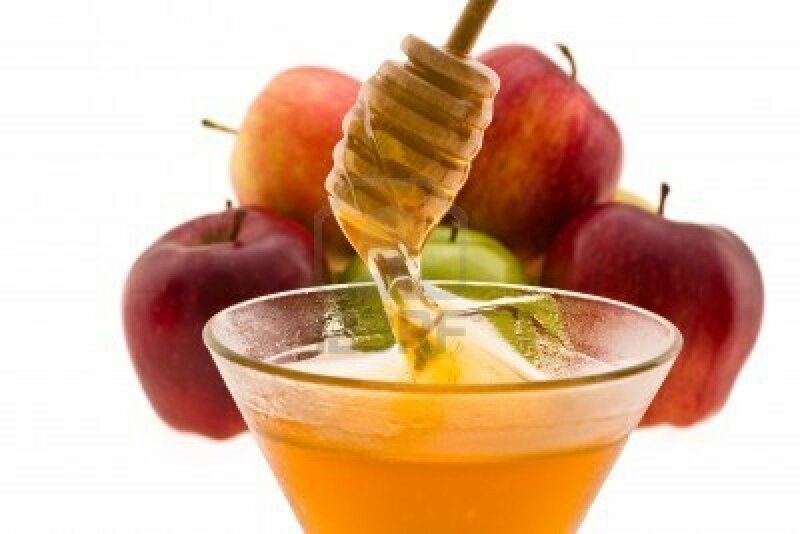 The apples are connected to being fruitful in all manner of endeavors and the honey is meant to signify having a sweet, New Year. It is also customary to dip the challah (special holiday bread) in the honey, to signify that the New Year will be as sweet as the honey. These channels of reflection and blessing can be tapped into as we previously stated. Some have the custom of eating from a fish head, which is accompanied by a blessing requesting, “May we be like a head (a leader) and not a tail (follower)” or “May we be plentiful and numerous as the fish which symbolizes prosperity and fertility.” We also eat the newly ripened pomegranate, which is one of the seven special species of the Land of Israel. This gorgeous red, delicious tasting fruit is said to have 613 dark red seeds laden with health properties. These seeds relate to the total number of mitzvot (commandments) in the Torah. We eat this fruit to show our hope of performing many mitzvot during the coming year and that our merits will also increase as a result. The festive meal goes on with additional symbolic foods such as carrots, leeks or cabbage, beets and gourd. A blessing is recited before eating the foods and the blessings and symbolism are listed in the holiday prayer book. 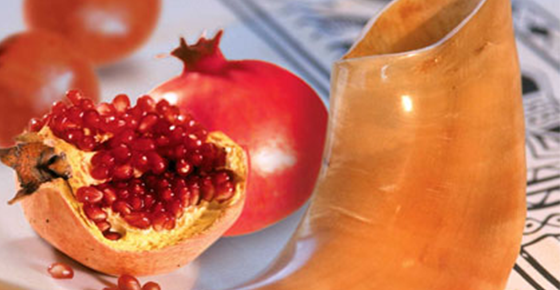 The custom of eating the symbolic foods is based on an insightful Talmudic teaching. Many people and communities develop their own interesting customs relating to foods eaten on the first night of Rosh HaShana, making it fun and interesting for the children or guests participating. There is a custom that we do not eat nuts on Rosh HaShana because the Hebrew word for nuts has the same numerical value as the Hebrew word for sin. We do not want any connection to sin on this auspicious night of new beginnings, in which we coronate HaShem as King in our lives. It is the custom of many to wear white on Rosh HaShana because white symbolizes our desire to be pure and draw close to G-d. On the second day of Rosh Hashana, Jews go to a body of water to recite special prayers which contain a reference to the forgiving G-d who “casts our sins into the depths of the sea”. After the prayer, Jews symbolically throw their sins into the water to be carried away and never seen again. This ritual act has great significance and serves to indicate our desire to return to G-d fully cleansed. To summarize: The symbols are energetic pathways that have been in place for a long time. By consciously choosing to attach to the symbol, we enter the energy channel of that symbol and consciously derive all the benefits it has to offer. We become receptors for the knowledge and use of the symbols over the generations. We will derive great spiritual benefit if we utilize the POWER AND BEAUTY OF JEWISH SYMBOLISM both as we greet the holidays and lead our daily lives. 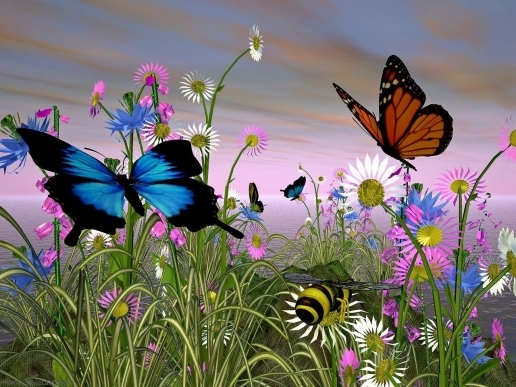 G-d has gifted us with symbols to transmit renewed inspiration to our physical and spiritual encounters. This understanding brings me to a state of deep gratitude, for in each symbol, G-ds love is truly revealed, as it enables us to draw closer to the source of all Blessings in the world. Just as a gift from a spouse or friend is a symbol of their love, so too these symbols are divine gifts of love to inspire us in a deep way. I bless all of Am Yisrael that we utilize the power embedded in the symbols to gain access to their depth, beauty and power. I bless us that we take the time to connect to the symbols thus accessing their deeper meaning giving a dynamic, spiritual charge to our holidays. Now, personally I did not understand the deeper meaning of what it meant to live in the holiest place in the world and many acquaintances would comment on the intensity of living here. This aroused both a curiosity and a desire in my husband and me to seek out Torah knowledge related to this topic. We studied seforim (Torah teachings) on the topic of the Holy Land and came to realize that we were extremely uninformed regarding our understanding of the depth of the Kedushah present in the Land itself. 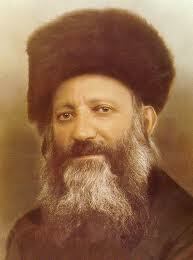 Rav Avraham Yitzchak HaCohein Kook ztzl, in his safer (book) “Lights on Orot”, states that the Land Of Israel has a Divine inner attachment to G-d unique to the Jewish people. This inner attachment contains a unique spiritual Holiness that we can tap into. So, as we began to understand more fully the power and beauty of the Divine life force present in the land and the people, we felt compelled to refine our relationship to HaShem, His Torah and mitzvot and His beloved Land. Prior to leaving Denver, we identified within ourselves the need for a spiritual tune-up and we were open to receiving the wisdom and guidance to make the necessary changes. We came to understand very quickly, that living in the Courtyard of The KING, demands a deeper awareness of our behavior. We began to understand on a much deeper level that we were not to live just a religious, Jewish life, but that we had to strive to lead a G-dly life– a holy life that demands awareness, accountability and responsibility, especially in the realms of words, thoughts and deeds. Refining these elements is the pathway to holiness, because holiness demands that you take on the task of elevating yourself and the material world. As the deeper understanding began to sink in, we began to assess our interactions in our home and look at ways to refine and upgrade our devotional offerings. Shabbat was one of the first things that claimed our attention. Shabbat is a profound time to refine our speech and elevate it from the mundane weekday conversations. Soon after we arrived in the Old City, got our lift and got settled, we began to have Shabbat guests…anywhere from 1 or 2 to 15 or 16. We were blessed with a good sized apartment and a huge dining room table so it was very exciting, rewarding and challenging at the same time. After a few weeks of rather chaotic Shabbat table experiences, my dearest husband said to me, “From now on, we are going to keep our Shabbat table conversations ONLY to words of Torah or stories of inspiration”. He said we are going to have rules at our Shabbat table. No more mundane conversations or listening to others’ problems and we will have only one person speaking at a time. Now, don’t get the wrong idea, my husband is a warm, funny kind of guy. He is not controlling or rigid but when he taps into his inner truth and gets a Torah flash of wisdom, he doesn’t mince words. He is one of these men who know what they want and communicate it well especially if it is important. SO after he delivered his Shabbat decree, I said to him darling ( yes, I really call him Darling), “giving over those rules might really feel weird to people especially young people who are not fully Torah observant.” Wow, that did it…. He said to me, “Ariella Bracha if you think we need to worry about what others think about our rules at our Shabbat table in the Courtyard of the King, you are crazy” and you know what? He was right. The people pleaser in me was afraid of what people would think, can you imagine? dimension makes it feel as if it is new because it is empowered in a way it never has been before. Isn’t this awesome? This in and of itself should cause everyone to make ALiyah! Well, anyway I saw and felt evidence of this very real reality in the newborn strength and value defining aspect of my husband Avraham and I loved it. SO, the very first Shabbat with our new rules, which my husband gave over so elegantly, was the beautiful, deeply meaningful Shabbat we were looking for. All the guests said they wished every house had these rules. SO from that newborn perspective of the true way to adorn our speech (which is what makes us human and defines us) on Shabbat and to really dive into the intimacy of Shabbat, Hashem gifted me with a BIG SURPRISE……the inspiration for my own personal Dvar Torah straight from my heart to each of you about our Beloved Shabbat. Please enjoy it and share it and be inspired to adorn Shabbat like you would adorn yourself with a dazzling piece of jewelry. 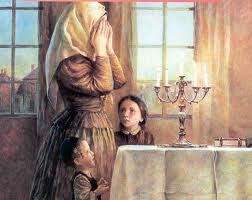 Shabbat is the everlasting sign of the covenent between HaShem Yisborach and HIS beloved Jewish children. It is our sacred bond of commitment signed with G-ds personal seal. It is the greatest antidote to the mundane demands of daily life and has the potential to uplift us to dizzying heights of connectivity and spiritual pleasure. I have acquired the understanding that lighting Shabbat candles is THE most auspicious and powerful opportunity for Jewish women to draw down blessings into their homes. Knowing this, I strive to utilize the creative powers of my imagination to transform my candle lighting into a dynamic soul encounter. Imagination is an extraordinary, sublime spiritual gift that HaKadosh Baruch Hu has freely given us to use in positive ways. I take full advantage of this awareness by striving to create a masterpiece in time and space like an artist using a brush to paint vibrant colors on her canvas. Then with the deepest delight in this precious mitzvah, I engage all the powers of my imagination. I light my candles filled with golden oil and joyously recite the Blessing. While my eyes are closed, I raise my hands upwards to draw down the dynamic energy of Shabbat. I allow it to envelop me. I picture in my mind the sparks of my neshama blending with the life force of Jews throughout our history. I send the Divine emanations of the holy energy throughout the house clearing away any residue of negativity present in our home. I visualize the exquisite Shabbat energy radiating its warmth throughout our home touching everything in its path illuminating it with rays of golden sunlight. As I draw down the spiritual energy and bask in its purity and richness, I visualize the flame of my candles which is compared to the soul, rising upwards through the channels of Divine emanations spreading throughout the cosmos. I visualize the crown of Shabbat descending and I gently, lovingly place it on my head which is where the soul resides. I adorn it in gold with the Hebrew letters of my name which is my essence and then I know I have greeted the Shabbat Queen with all my heart, mind and soul. 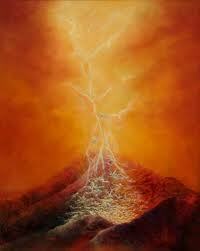 I have ignited my soul to intermingle with the sparks of Shabbat imbedded in creation. I have fully engaged the extraordinary powers of my imagination to craft the fine art of mindfully greeting Shabbat and have helped her make her grand entrance. I have slain the dragon of habit that causes us to merely go through the motions of performing the physical act. I have awakened my soul to the limitless beauty and artistry of greeting Shabbat with my own personal signature as she arrives at our home. Please be clear that I understand that a busy mom with lots of children may not have the luxury of time or quiet like I have or that my particular avoda may not speak to you personally. The Piaseczno Rebbe OBM, Rabbi Kalonymus Kalman Shapira Zt’zl, has a stunning gem of wisdom on this issue. He says, paraphrased from the book, “To Heal the Soul” by Yehoshua Starrett, a person must be the individual they truly are inside and bring out their own unique essence by approaching everything they do with their own personal signature attached like an artist signing his canvas. He says each of us has the obligation to express his unique and individual self and through the personal efforts of creating and sharing our truest selves, we will reach HaShem. masterpiece in time. Your soul will thank you and G-d will too.